Our ascendant dining scene makes it more likely that you can have a religious experience in a great restaurant. But Pittsburgh being Pittsburgh, you still can have some great food experiences in religious settings. So many of our ethnic festivals happen in churches and cathedrals, including the Greek ones that seem to be running, somewhere, every weekend. Other houses of worship open their doors to seasonal feeds, from holiday bake sales and “cookie walks” to spaghetti dinners and even a “Soup-A-Thon” (at Monroeville’s St. Nicholas Serbian Orthodox Church). Here are some more votes against the separation of church and steak. Pittsburgh is hooked on Lenten fish fries. In a region with a lot of Catholics, lots of people still give up meat for Lent (the six weeks from Ash Wednesday in February leading up to Easter), but that doesn’t mean they don’t eat well at fish fries at so many places that the Pittsburgh Catholic newspaper publishes an annual Fish Fry Guide. There’s even a Lenten Fish Fry Map online, and an organized tour of churches and their fish fries. While the mainstays remain the fish sandwich and macaroni-and-cheese, a few serve fancier dishes such as linguini with salmon and lobster ravioli, and a few even serve beer: St. Bernard in Mt. Lebanon last year was selling $2 drafts of Great Lakes Brewing Co. Elliot Ness amber lager. One of the best food fests happens on the first Saturday in May at the Korean Central Church in Shadyside. This event — this was its 21st year — takes over the whole corner, as Pittsburghers of all walks of life nosh on exotic fare ranging from bulgogi (Korean-style barbecued beef) to haemul pajeon (seafood pancake) to sushi roll in colorful floral designs, all made by ladies in hairnets in the church’s basement. 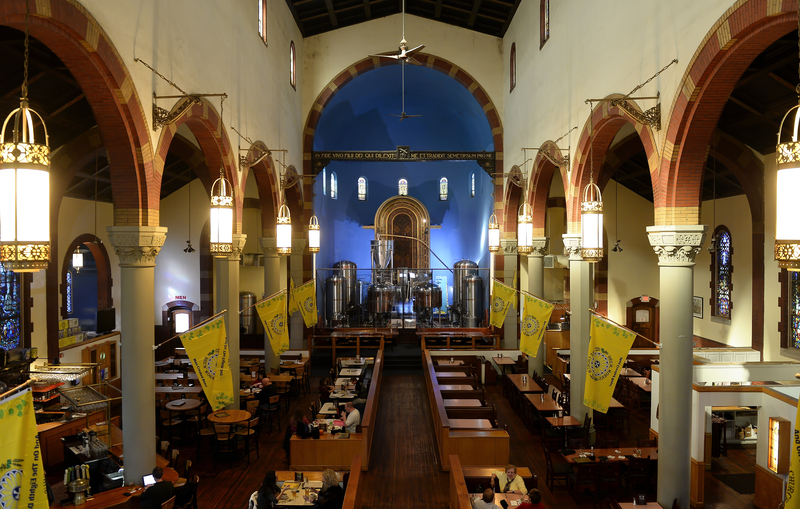 Any craft-beer fan needs to visit the altar of the former St. John the Baptist Church in Lawrenceville, which is now a celestial-blue brewhouse for the Church Brew Works. Remodeled and reopened as a brewpub in 1996, this stunning place, where you can sit in a cut-down pew, has regular brews named Celestial Gold, Pipe Organ Pale Ale and Pious Monk Dunkel. They’ve earned numerous medals in competitions such as the Great American Beer Festival, which last year awarded the place a bronze in the Belgian-Style Tripel category and in 2012 named it the national Large Brewpub of the Year. Don’t miss the Pittsburgh Pierogi Pizza. South Indians love to eat, so it’s no surprise that they can eat at this landmark white Hindu temple, one of the first in North America, built in 1976. It’s located on a wooded hillside just off Interstate 376 East in Penn Hills, east of Downtown. Pilgrims from all over and other visitors can get a range of simple, cheap vegetarian fare such a yogurt rice and tamarind rice. If you’re still hungry, do what the South Indians do and head to the nearby Udipi Cafe and eat again. Just south of the city off Interstate 376 West, you can drop into an Indian restaurant in a former Catholic church turned Indian Community Center — Cafe Delhi. Like Udipi, it lets you bring your own booze.